Confession – I am ardently in love with fresh basil. Head over heels. Smitten kitten. I want to marry it. All of those things. Basil is wonderful in many Italian dishes and paired with its BFF’s, tomato and mozzarella, but basil is also a marvelous ingredient in buttery cookies, especially when you also add in the citrus tang of lemon and lime zests. I found this recipe a little odd. The dough comes together in a food processor, similar to making pie dough. The recipe said the dough would form “moist clumps,” but mine wouldn’t hold together to form a ball, so I added in 2 teaspoons of milk to make it wet enough to shape into balls. The extra milk is probably why the cookies stayed a little moist in the middle, so if I make these again I will poke a few holes in the center of the cookies with a toothpick before I bake them . Overall, if you love basil like I do, you will want to experiment with these cookies so you can enjoy the burst of fresh basil, citrus and butter when you bite into them. Preheat the oven to 325 degrees and line 2 baking sheets with parchment. Combine the flour, sugar, butter, basil, zests, lemon juice, and salt in the bowl if a food processor and pulse a few times to combine. If you don’t have a food processor, whir in a blender. Slowly drizzle in the milk until dough just comes together. Roll tablespoons of dough into balls and arrange on baking sheets, leaving 2″ between each. Take a flat-bottom measuring cup and lightly cover it in additional powdered sugar, then press onto each ball of dough to lightly flatten it. Sprinkle tops of the dough with coarse sanding sugar, if desired. Using a toothpick or piece of raw spaghetti, poke a few holes in the center of each cookie. Bake until the edges are brown, around 12-15 minutes. I hope you don’t un-friend me for this, but I don’t really like basil. I know, I’m weird. I think it has to do with me not liking Italian food… I do like it in cocktails with citrus though, so I can imagine these cookies are quite tasty. These look so simple and delicious! I too am in love with basil—I sense they give these cookies a great twist! I’m totally with you – I absolutely adore basil. I cook with it all the time and have made cocktails and even ice cream and sorbet with it, but I don’t think I’ve ever made cookies with it. I can’t wait to try these out! I, too, love fresh basil. I also love the idea of pairing it with citrus – these look awesome! Hey now: Basil and I are already an item. Get your own herb. Yum, these cookies sound amazing! Like they’d be so zingy and bright. I for one, looooove basil. Probably because I’m an italian food whore. I mean really, pesto? I could drink it by the gallons. Although that would probably be disgusting. Anyway, the cookies, I love them. I bet they’d be good with tea too. I love basil too! I’m always looking for more foods to sneak it into. I can’t wait to give this recipe a shot! These look FANTASIC! Nice work. These sound intriguing. 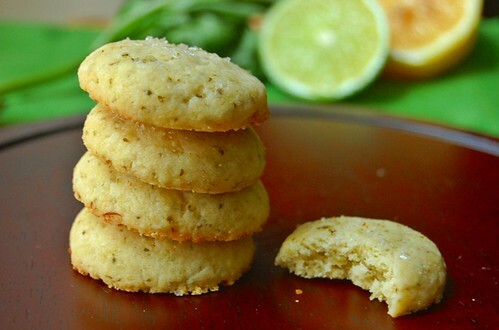 I’m not a huge basil lover, but I like the idea of using something normally found in savory recipes in a cookie…and paired with lemon and lime. Definitely worth a try. Love your photos too! Have to cook this… NOW. My problem is that I haven’t been able to find dairy-free stuff in my town at reasonable prices. Sounds and looks scrumptious! Looking forward to giving this a try, and soon. I adore basil as well – but, in a cookie? We shall see…….we shall see! Yum! would this work with wholewheat flour? Hello there! I suspect the delicate citrus and herb flavor of the cookies does best with AP flour, but if you don’t mind losing a bit of that for the whole wheat (of which I am a big fan), go for it and let me know how it turns out. ooh… these will probably be fabulous and refrshing with tea! I was beyond excited to see your recipe when it popped up on Freshly Pressed. I am now off to the store for basil and citrus and this cookies are being made today. Thanks! I’ve made cookies with Rosemary but never with Basil … plan to try this recipe in the next week or so and will let you know how they turn out. I can only dream of keeping THREE healthy basil plants alive at once! Jealous! I too love basil. I love the way you characterize your love affair with basil. Cookies n’ basil; what an interesting combo! They look absolutely delicious 🙂 Thanks! What an inspirational read. Looks like any chance of a diet is out of the window now I have found your blog! I love your work and having just received the Versatile Blogger award, I’d like to pass it on to you. Visit http://theemeraldgarden.wordpress.com/2012/01/26/versatile-blogger-award/ to find out more. Congrats of the Freshly Pressed and the Versatile Blogger Award. Three things: First, dear all-that-is-good-in-Foodieland, I must make these as soon as my basil comes up. I do an herb shortbread every year that is good, but just reading the recipe for these made me swoon. Second: I can’t follow you on Twitter, because your twitter button takes me to a dead page, and this is very sad. If you’re still on Twitter, can you update it so I can follow and drool over fabulous baked goods? Shwankie, they are dreamy for basil lovers…they truly are. I am not sure what is happening with Twitter! I changed my username a few months ago but it looks updates…anyway, it is @aimeeseavey if you’d like to follow! Yum!! Congrats on being Freshly-Pressed. Cookies to celebrate! Reblogged this on Bettys Cupcake Factory. I loveeee fresh basil too and these look delish! Now to find a way to make them gluten-free!!! Oh my goodness, everyone! What a thrill to be featured on Freshly Pressed and get so many wonderful comments from all of you! I am so glad to know I am in such tremendous basil-loving company (though we still love you, Beantown Baker). This time of year, citrus and fresh herbs do a great job of reminding us (especially in New England) that warmer days are coming. Thank you all so much for visiting! looks so delish! oh by the way, is it okay to put some nuts in there? any suggestions cause i need ot make use of the almonds and the walnuts that my sister gifted me. thanks and congrats on being FP. Your cookies look heavenly. However, I’m not as crazy about basil as you are. I’m going to try them with lavender sugar instead of the basil. That should go well with the citrus, too. Great photos! basil and lemon in a cookie??? omnomnomnom will definitely have to try this one!!! I love all herbs and I love butter cookies. This combo sounds like I might eat half in one sitting. The use of a food processor (something always goes wrong!) means I’ll be talking my sister into making them! I’m Italo-American and of course I love Italian food! I have to bake these cookies for my friends, Needysweety, Zoe and Bella. Looks good. I’ll try baking those tomorrow. I’d really love to try this recipe, but can’t find butter in stick in my country, so how many grams approximately for the butter? For powdered sugar, do you mean icing sugar? Hello Wita! Yes, powdered sugar is icing sugar. Also, it looks like 1/2 cup of butter comes out to around 113 grams. Hope that helps! I had a romance once with some Rosemary Shortbread (which looks similar to your creation in a different herbal vein). Inspired. Must try. I had a romance once with some Rosemary Shortbread. It leaned heavily towards your Basil creation, in a similar vein. Inspired. Must try. Oooh, these sound so deliciously different! I’ll share on pinterest.com too! interesting and looking delicious too. I can understand your infatuation! Pasta without pesto, to me, is like bread without butter. But I never thought of putting into something sweet like cookies, so I may have a go at it. Thanks for the idea! Keep ’em coming! Love this recipe, can’t wait to try it at home! The photos are so good that I opened the appetite! Lovely! I adore fresh herbs in sweets. Delicious, and beautiful photographs. Living in the mid-Atlantic area means buying fresh basil at the grocery store in the Winter. However, it still gives the jaded palate a nice kick. I’ve recently added it to my juicer along with fruit and carrots. My granddaughter loves it too. For the juice recipe check my blog, healthchat.org. I love basil, I will try them for sure! Now, I do love me some good butter cookies!! Gorgeous little cookies, beautifully shot. I am not fussed about cookies generally (or I tell myself that anyway!) but with the flicker of lemon and the hefty whack of fragrant basil, these look like a must-bake. Will try with Thai basil for its hint of aniseed, if that’s allowed. Btw, I think if you used cream cheese instead of milk the soft-center issue may be resolved. Don’t quote me though. What an interesting combination! I’d never have thought of basil in a sweet. I love anything lemon, though, and this sounds so good that I think I’ll even make some, and I am not a baker at all. Thanks! Wow! They look and sound amazing. I love basil as well, though it doesn’t sound like quite as much as you do! =) I was looking for a project to do this weekend, so I am going to give these a try. Thanks for the recipe. Congrats on the post. I really liked your first sentence of the post…it made me chuckle. The recipe sounds wonderful! 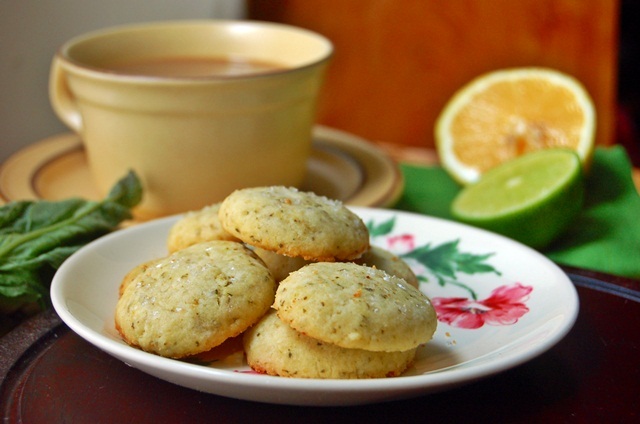 The cookies sound very much like a shortbread cookies, so if I may suggest…try blending the sugar, butter, and herb/citrus ingredients together with a mixer until well blended. Then add the flour in increments blending by hand until well incorporated. That might make a better dough. I’m going to try this recipe…thank you for posting it. Can’t wait to bake these…. wow, what a lovely combination-basil and lemon. gotta try these cookies! interesting combo of ingredients. i love smell of fresh basil! This looks like a fabulous cookie recipe. Can’t wait to try it. Thanks for sharing. those look pretty good. I’m kind of weary of adding spices that are typically used in savory dishes to sweet foods (once i tried rosemary cake — ick!) but these do look good. Love this recipe, looks absolutely delicious! Thanks for the recipe, I made them yesterday with just slight variations. I also discovered how easy it was to turn plain old flour into basil flour… so easy! Congratulations on being Freshly Pressed! I’ve just found you through The Emerald Garden Blog and am so happy to follow. I love vintage flatware and dishes as well:) I love the look and feel of your blog! I love fresh basil. I generally love cookies. Ditto lemon and lime. These three combined? These are a must try! Thanks for posting this recipe. Love the blog and these cookies look delicious! Wow, they look soooo good. Mind-blowing revelation: poking overly-moist cookies with toothpicks! You’ve just rocked my world sista! Oh, wow, these look so scrumptious! I’m so glad that I’m not the only person who thinks herbs belong in desserts. If you love basil, you should try adding it to rice pudding. I made a vanilla-basil version to go with some Thai food, and it was fabulous. I’d be happy to share the recipe if you have any interest. Happy cooking!